What Makes a Jib Crane Work? 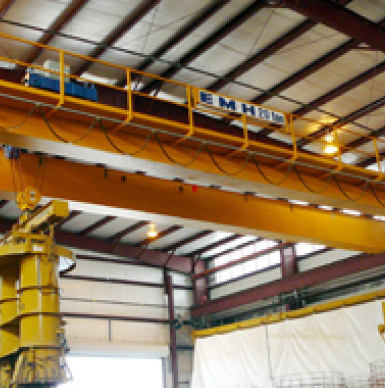 | EMH, Inc.
Any factory can use a jib crane to help with effectiveness and efficiencies. The flexibility of configurations make jib cranes adaptable to almost any need, saving you money and timeWhether floor mounted job cranes or wall mounted jib cranes. While there are numerous types of floor-mounted jib cranes, the most popular is a free-standing floor-mounted jib crane as it is constructed to stand on its own in the middle (or on the side) of your factory floor without reinforcements. A floor-mounted jib crane typically fas a reach of 25 feet. While called wall-mounted jib cranes, most of these jib cranes are actually mounted to a steel column. A wall-mounted jib crane is often a tie-rod jib crane, where the tie-rod is mounted to the wall above the boom and tied at the far end of the boom to support the weight. The wall-mounted jib-crane can also be a wall-cantilever jib crane, whereas a beam is used without a lead supporting tie-rod. The tie-rod jib crane is typically chosen when maximum lifting height is not as critical as price.